Spinach and buckwheat soup that is creamy and filling. Here is a winery green soup that promises the warmth in every sip. 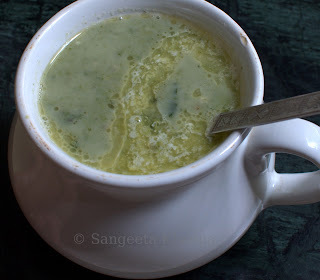 Spinach loves butter and cream and this soup makes use of both the elements to enhance the flavor and nutritive value of this green spinach soup. Wait, there is buckwheat too and that makes the soup creamier.Buckwheat is a grain that becomes mushy when pressure cooked and can be creamed with the spinach easily. Use whole buckwheat or groats or the porridge variety. If you are doubtful about he grain how it looks like, Buckwheat comes in three forms, as available in markets. The one with it's shell is dark brown almost black in color, the whole buckwheat (shelled) is a pretty shade of light olive green and the groats or broken buckwheat is like a semolina or couscous broken to uniform or irregular coarse powder. A large picture would make the difference clear.. I buy whole buckwheat from Down to Earth, an organic brand or shelled groats from Navdanya or other places that sell organic stuff. The whole buckwheat can be briefly whizzed in the mixie so the shell breaks, then it is cleaned by sieving the stuff, the coarse powder is the result which is used in this soup. This coarse powder is often available in the stores by the name of buckwheat porridge. I had some buckwheat groats and added them after pressure cooking the spinach. The result was quite good regarding the creaminess of this soup. Adding some full fat milk helps in that regard. This is a truly fasting recipe, that helps in detox, the real reason of fasting. Pressure cook the spinach with 1/2 cup of water till the first whistle blows. I find it easier as I use a stick blender to liquidise the soup and the pressure cooker pan is the right depth for it. If you are comfortable with pan boiling go ahead. Spinach doesn't take much time to cook. Boil along the buckwheat too if using the whole buckwheat. Add the groats if using, salt and pepper to the boiled spinach and boil it for 10 minutes till the buckwheat groats get cooked and disappear in the cooking liquid. Add water during cooking if required. Blend the cooked mixture using a hand blender or whatever way you like. Add the milk and give it a light boil. Adjust seasoning, pour into soup bowls or mugs, top with butter and serve hot. This is a filling soup I love for my dinners. Actually any meal can be a soup meal for me. 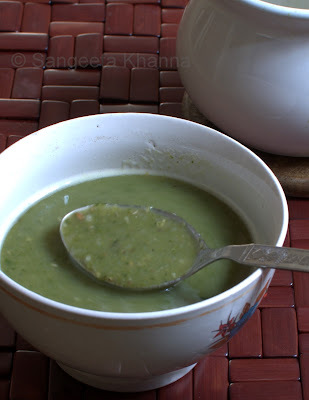 This one is a perfectly aromatic warming soup I can have in the nippy evenings of Delhi right now. Then sometimes I get the second helping of the soup late in the night with a pinch of cinnamon added. Very healthy soup.. looks Yummy !! I am unable to see ur pic but read whole recipe. Sounds very interesting. I wonder why you couldn't see the picture Subhashini. 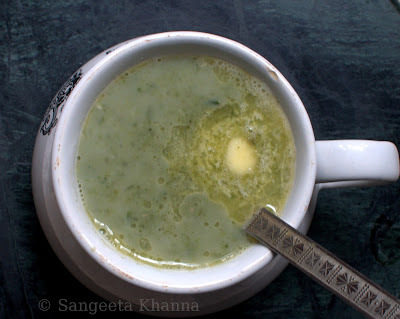 Very healthy soup, I have never tried this soup...reading your blog makes me too concious to switch to lots of salads and soups...thanks Sangeeta :)! 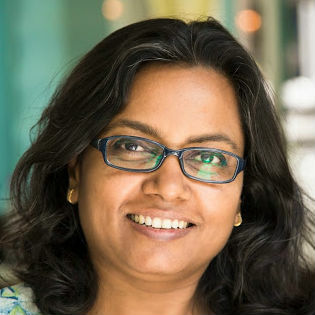 I have the same question as Amrita above - is buckwheat the same as kootu?